This Sunday we celebrate the Solemnity of Most Holy Body and Blood of Christ. The solemnity underlines our unity (communion) with Christ - the Body, and we - his members. This explains why Pope Francis has decided to unite all Catholics around the world before the real presence of Christ in the Eucharist; Christ who is the source of our communion with one another and with the Father. But while the Body and Blood of Christ unites and nourishes us spiritually, we can easily forget and neglect the social justice dimension of the Eucharist. Is there a social justice dimension? Yes, there is. On the Occasion of the Year of the Eucharist (October 2004 to October 2005), Pope John Paul II in his Apostolic Letter Stay with us Lord said: “Can we not make this Year of the Eucharist an occasion for diocesan and parish communities to commit themselves in a particular way to responding to one of the many forms of poverty present in our world?” He said that “The criterion by which the authenticity of our Eucharistic celebrations is judged will be our mutual love and in particular our concern for those in need”. That is why the Apostle Paul says that it is “unworthy” of a Christian community to partake of the Lord’s Supper amid division and indifference towards the poor (1 Cor 11:17-22, 27-34). Our Catechism (1397) tells us: “To receive in truth the Body and Blood of Christ given up for us, we must recognize Christ in the poorest, his brethren”. The Eucharist sustains us as the body of Christ in the world following the mission of Jesus to the poor (Lk 4:16-19). 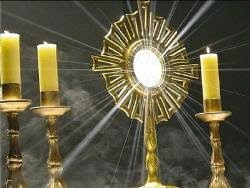 When the Eucharistic meal is shared equally by the faithful there is no division. Yet we often leave this “meal” and divide/discriminate against our brothers and sisters according to the social categories in which we place them. Continued injustice, discrimination and other forms of structural injustices reflect either a lack of understanding of the social dimensions of the Eucharist or a lack of willingness to act on the social imperatives of the Eucharist. Our celebration of the Eucharist therefore cannot be divorced from its social implications. “The Eucharist commits us to the poor” (Catechism, 1397). The US Catholic Bishops in 2003 said that, the Eucharist challenges us “to seek a place at the table of life for all God’s children” (cf. A Place at the Table). The Gospel reading from Luke on the miracle of the multiplication of loaves underlines this social-justice dimension pointing to Christ’s compassion and love renewed every day at Eucharistic celebration. By eating this heavenly food, we become one with Christ, sharing in his life, his strength, his purpose and mission. What message do we take home this Sunday? 1) The Eucharist is a real memorial of the sacrifice Christ offered for the liberation of everything that oppresses human beings, but above all liberation from sin. 2) Our Sunday celebration of the Eucharist cannot be divorced from the injustices around us because by its very nature, the Eucharist is a proclamation of communion and inclusiveness. 3) There is an essential relation between our sharing of the Eucharist each Sunday and the food items we bring for distribution to the poor through our parish social ministry.